Uw leverancier voor nieuwe, refurbished telecom &netwerk apparatuur. De producten leveren wij refurbished en getest aan resellers, telecom bedrijven en eindgebruikers. Met een eerlijke prijs/garantie policy van 6 maanden op onze gebruikte producten. Your supplier for new, refurbished telecom & network equipment. The products we provide are refurbished and tested to resellers, telecom companies and end users. With a fair price / warranty policy of 6 months on our used products. Nieuwe producten leveren we met de volledige fabrieksgarantie. In deze webshop bieden wij u een groot deel van ons assortiment aan maar onze voorraad is te groot van omvang om alles aan u te kunnen laten zien. Mocht het artikel dat u zoekt niet in de webshop zijn opgenomen neem dan gerust contact met ons op de kans is groot dat wij u toch kunnen helpen. 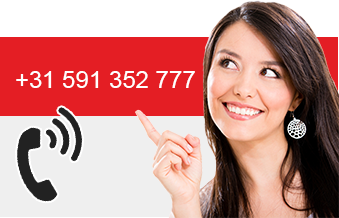 Heeft u iets aan te bieden op telecom of netwerk gebied of wilt u meer informatie over onze producten, kunt u contact met ons opnemen via het contactformulier op deze site. Afhalen en demontage op locatie behoort in de mogelijkheden. Used4telecom.nl is een onderdeel van handelsonderneming Barenkamp. used4Telecom.nl is a company with a large stock of refurbished telecom.network server products, such as telephones and PBX.s (and all accessories) with experience'. We supply our products tested and cleaned to resellers, Telecom companies and end-users with a fair price / warranty policy of 6 month . In the shop we offer you a large part of our range of our stock, but is is too large to be able to show everything. If the item you are looking for are not listed in the shop please feel free to contact us the chance is great that we can still help you. Send after you have placed your order in the shop you valid VAT number to us by mail So that we can replay U the invoice without VAT. Do you offer something on Telecom or network area or want more information about our products, please contact us by the contact form on this site. Pick-up and disassembly on location belongs to the possibilities. Used4telecom.nl is part of trading Barenkamp.